1. Thank you, Kansas and Oklahoma! Sitting in my room watching every single twist and turn of one of the great all-time college basketball games this past Monday, I couldn’t help but continue to ask one question while watching the Oklahoma-Kansas instant classic: when was the last time I was this thoroughly enthralled by a regular-season college basketball game? Then another question popped up: have I ever watched a college basketball game this good in the regular season? 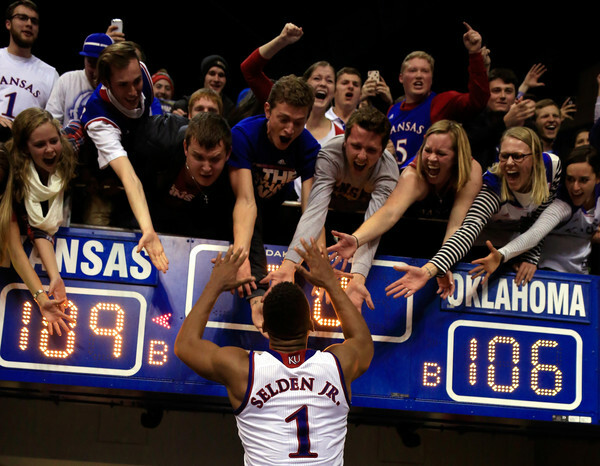 Thankfully, I could think of one regular-season game that was as good, if not better, than the epic that the two longtime Big 8/Big 12 rivals put on inside of Allen Fieldhouse on Monday – and it was one that I actually attended in person. 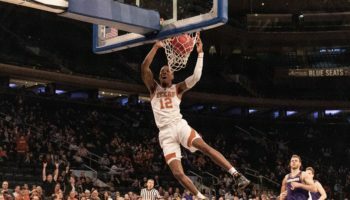 Here’s all you needed to know about what happened in that game at The Meadowlands: Rashaad Carruth, who wasn’t one of the future nine NBA players on the floor, played every bit like the McDonald’s All-America he was, breaking out for 19 points in 21 minutes; Mike Krzyzewski, with his team down double digits in the second half, benched all five of his starters – a unit that included Jason Williams, Carlos Boozer and Mike Dunleavy Jr.; After the bench kept it close, Williams proceeded to put on a scoring exhibition for the ages, pouring in 25 points in the game’s final 16:13 on his way to 38 points, the highlight of a campaign that saw him win the Wooden and Naismith Awards. Oh, and the game went into overtime. Duke 95, Kentucky 92. Final. All that is to say that the Kansas-Oklahoma game was every bit as good, dramatic and breath-taking. It almost wouldn’t do it justice to recap the game, especially if you actually saw the game. From Buddy Hield scoring 46 points (an Allen Fieldhouse record for most points by an opposing player) to watching numerous clutch shots extend the game time and again to the unbelievable depth shown by these two talented teams, and most of my Twitter timeline was filled with hopes that the game wouldn’t ever end. Unlike some other memorable multiple-overtime games of recent vintage, including the Syracuse-Connecticut six-overtime marathon in the 2009 Big East Tournament, the quality of play throughout the contest made the game stand out and separated itself from almost every regular-season game in the past decade (or more). Oh, and you knew that these were the first and second-ranked teams in the polls squaring off as well, right? There are games that live up to the hype, and then there’s what occurred on Monday. Thank you, Sooners and Jayhawks. It’s quite possible that the best program in women’s Division I basketball that has yet to appear in the NCAA Tournament in its history is the Duquesne University Dukes. it’s also quite possible that the “best never to…” tag will be removed by the time Selection Monday arrives in a couple of months. In each of the past seven seasons, the Dukes have recorded at least 20 victories, with all of those years ending with an appearance in the Women’s NIT. The last five of those seasons have seen the Dukes win six postseason games, all in the WNIT. 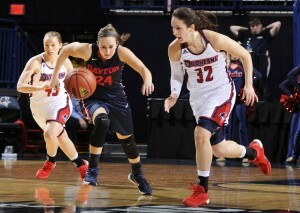 Unfortunately, Duquesne has fallen short in their quest to appear in the school’s first NCAA Tournament each season, with A-10 powerhouse Dayton, along with recent tournament champions George Washington, Fordham and Saint Joseph’s preventing the Dukes from the ultimate glory. This season’s squad may be its deepest and most talented, and that was put on display on a national stage in a 31-point win over the Flyers last Sunday. Senior guard April Robinson, who leads the team in scoring at 14.9 per game, recorded the third triple-double in program history, notching 17 points, 11 assists and 10 rebounds. Five players scored in double figures in the game, and each of those players – Robinson, Amadea Szamosi, freshman Kadri-Ann Lass, fellow newcomer Chassidy Omogrosso, and sixth man Deva’Nyar Workman – average more than 10 points per game on the season. 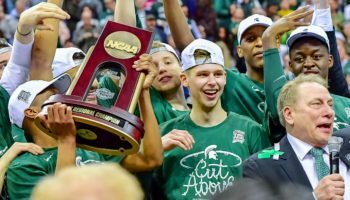 The Atlantic 10 is traditionally a multiple-bid league when it comes to the NCAA Tournament, but no team in the conference currently is ranked in the either of the major polls. In the Dukes’ favor, however, is that four A-10 teams currently sit in the Top 32 of the RPI rankings, and that includes Duquesne’s ranking of No. 26 as of Wednesday. (They just laid waste to the highest-ranked A-10 team in the RPI in the Flyers, who are currently at No. 18.) If you’re looking for non-conference meat on the bone, the Dukes’ résumé includes a home win over then nationally-ranked St. John’s (NY) on Dec. 19. After seven consecutive years of reaching the WNIT – but not making the NCAAs – it looks as if the eighth time will be the charm for the Dukes. After Oklahoma’s loss on Monday, there were only two teams left in Division I college basketball that still had a zero in the loss column. Raise your hand if you had both South Carolina and SMU as the last two undefeated teams? If you have your hand raised, you’re a liar. Really. While we’re not too surprised with the Mustangs’ start, even with the nine-game suspension of head coach Larry Brown to begin the season as they build upon their NCAA Tournament appearance last season (they are banned from the tournament this season), South Carolina’s strong start, while considered a surprise, has its roots in their play in the non conference last season. In getting off to a 9-3 start last season, Frank Martin’s bunch defeated two Big 12 teams that would eventually make the NCAA Tournament: Oklahoma State at home and Iowa State in a neutral site game at the Barclays Center in New York. Their strong play then was linked to a defense that held its opponents to 34.4 percent from the field in non-conference games. Alas, that number jumped to 42.7 percent in SEC play, the fifth-worst field goal percentage defense in the league, as the Gamecocks lost six of their first seven conference games and faded quickly into national irrelevance. Fast forward to this season, and after South Carolina went a perfect 13-0 in the non conference, they went to The Plains and defeated Auburn 81-69, starting SEC play much better than last season. There’s no real superstar on the team, with five players averaging double figures in points, and the leading scorer, Michael Carrera, only putting in 12.4 points per game. Again, it’s the defense carrying the day, as USC only allows its opponents to shoot 37.8 percent from the field while out rebounding their opposition by over 10 per game. The Southeastern Conference looks to be a better and deeper league than at any point in the last few seasons, with the improvement of the Gamecocks at the forefront of the league’s ascent. 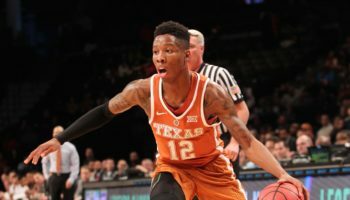 How good their defense holds up in conference play – something that did not happen last season – will go a long way in determining if they can snap the longest NCAA Tournament drought amongst all SEC schools, as they have not reached the Big Dance since 2004. 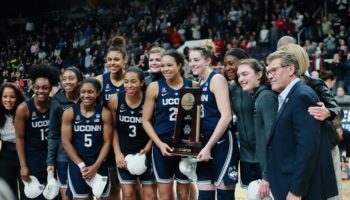 Last Monday, the top-ranked Connecticut women’s basketball team took down No. 6 Maryland in one of the showcase games in women’s basketball this season, as the contest took place in Madison Square Garden at the Maggie Dixon Classic. After the contest, our Lauren Foti caught up with senior forward Morgan Tuck, who scored her 1,000th career point in the contest against the Terps. Men: Valparaiso at Oakland, 7:00 PM ET, Friday, ESPN2: There’s a reason this game is on national television, and no, it’s not because it’s on a Friday, when people who aren’t interested in the game will be outside partaking in Happy Hour. The Crusaders and Golden Grizzlies may be the two best teams in the Horizon League, and watching Valpo’s stifling defense try to slow down Kahlil Felder, the nation’s third-leading scorer at 26.1 per game, will be a fascinating watch. 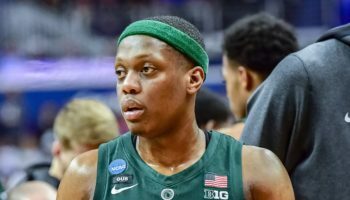 While Valpo already has impressive wins over Rhode Island, Belmont and Oregon State, Felder has already dropped 38 points on Michigan State in an overtime loss, as well as 30 points against one of the best defenses in the country in Virginia. Women: Utah at No. 11 Stanford, 10:00 PM ET, Friday: Off to their best start since the 2007-08 season, the Utes, led by first-year head coach Lynne Roberts, are 10-3 after their sweep of the Washington schools at home last week. Now comes the litmus test for Utah, as four of their next five opponents are against nationally-ranked teams, starting with this weekend in the Bay Area with the Cardinal and the 21st-ranked Cal Golden Bears. Following that is a trip to Arizona, where No. 14 Arizona State will wait next Sunday. The Utes’ first home game after their four-game road trip will be against No. 11 Oregon State. Talk about easing into conference play, huh? !